Connie, July 31 1938, courtesy of Cole Johnson. This is the final sci-fi Connie story we have available from Cole Johnson. If anyone out there can contribute scans of another complete Connie story (later than 3/26/1939), or can offer another sci-fi strip to take its place on Sci-Fridays, I'd be delighted and grateful to hear from you! Note that we elitists do not generally use digital microfilm material here on Stripper's Guide, so we would need sharp 300-600 dpi scans from newspaper tearsheets or syndicate proofs. I know you are not a fan of microfiche scans and the quality of the representation here is fine, but the Sedalia Democrat at Newspapers.com has Conny Sundays in sharp black and greyish white. I pulled one I can send you. Another person offered me good quality b&w scans from microfilm, and I admit the quality is pretty darn good. But I need to know if Connie continues as a sci-fi strip or not. If not, it wouldn't be a good candidate of course. 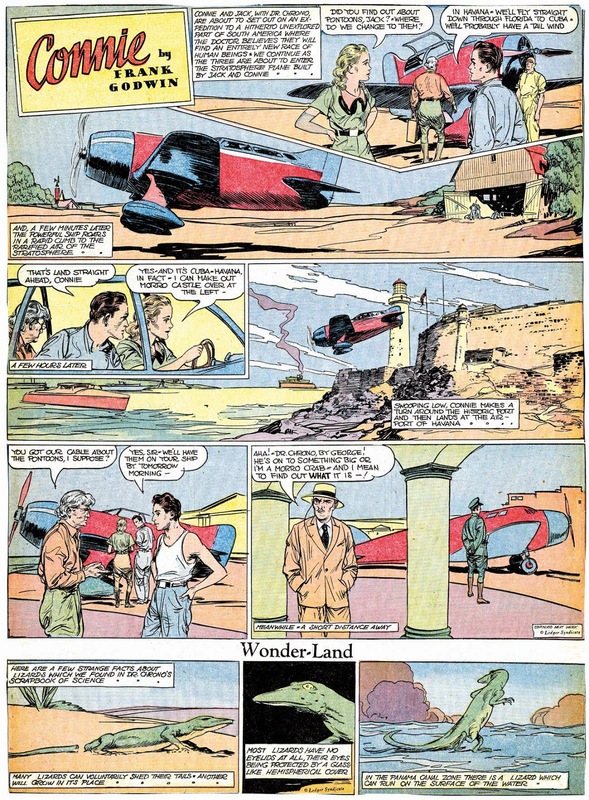 Do you know if the 1939-40 stories are sci-fi? The last 3 stories are S-F. Thank you Fortunato! Just the info I needed. I'll see if I can get those last three stories.